Hello! I hope everyone had a great holiday. As usual, it went by fast and I hardly took any photos, let alone any outfit snaps! I did a little poking around J.Crew online over the holiday, but the sale section seemed to be waning by the day so I was hoping things would pick back up after the holiday. I also have a week off work, so armed with a few returns (the size 10 Perfect Shirt in Stewart Plaid was exchanged for the 12) I decided to check out what my J.Crew retail store had to offer. Stores are currently offering 40% off which is the same as the online offer. The sale section at my store was pretty slim, heavily stocked with tees, some Cece flats and a lot of those stiff grey Pixie pants. 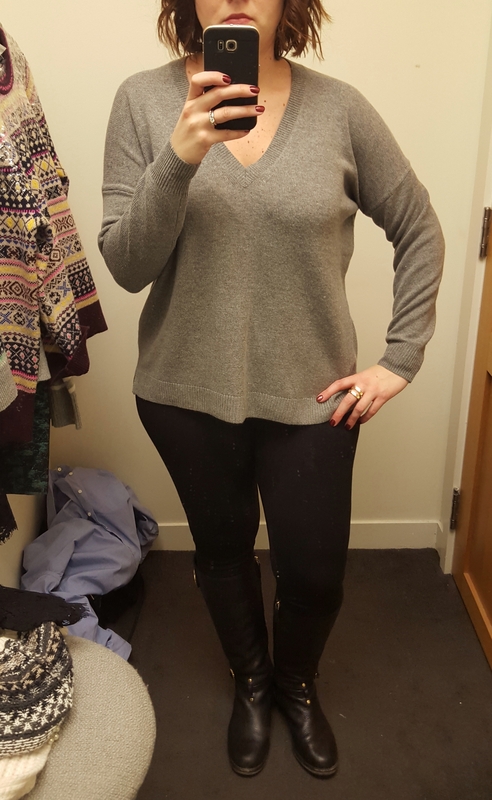 But…before long I had an armful of things to try on, most from the sale section. 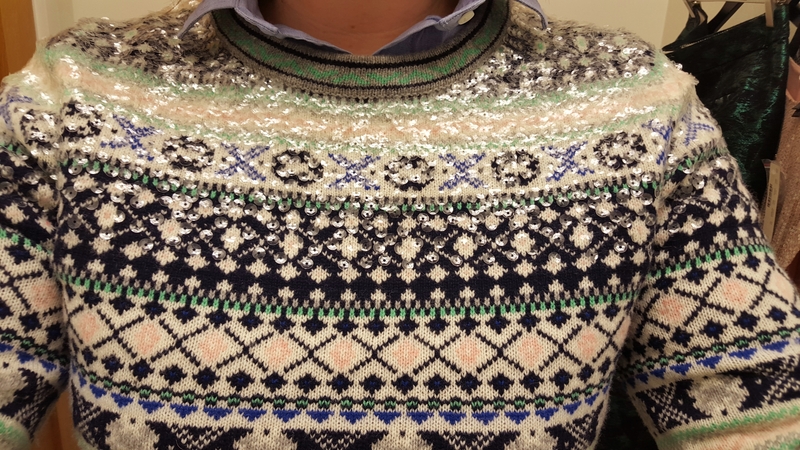 First up, the Sequin Fair Isle Sweater in Cement/Ivory. This was clearly a return and a size Medium. I liked the pale colors of this one, and the wool was soft. I liked that the sequins aren’t overly flashy but I do feel like they’re a little flimsy and I definitely was worried about them when I pulled the sweater off. 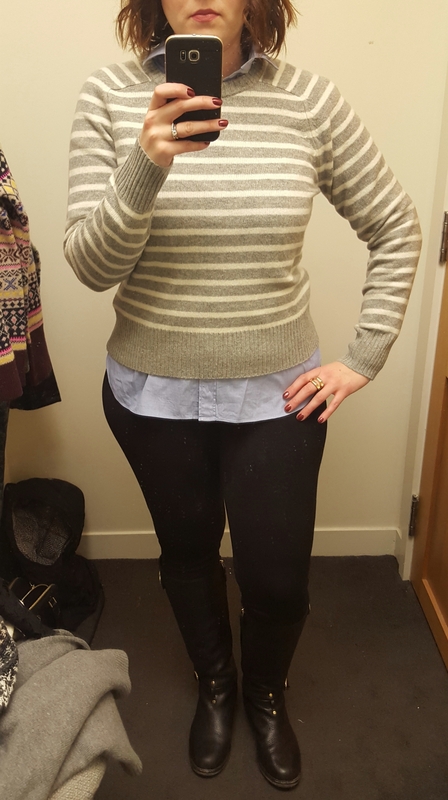 This size was a little shorter than I liked, it was ok with the shirt layered underneath but I wanted to try a large for comparison. They had plenty of the Raisin/Oatmeal color in stock so I tried a large for comparison. I wish the neon colors weren’t in this sweater, it could have been so much better with different shades of yellow and pink. 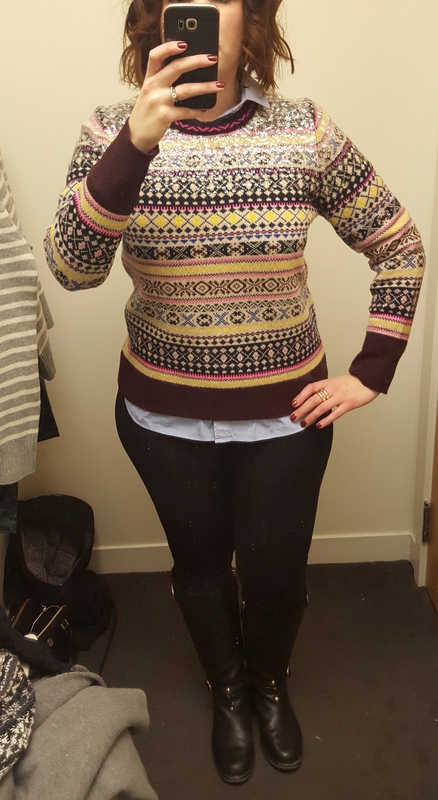 This is one of those sweaters that looks nice from far away, and up close…no. The large was the right size though, I had a little more room through the body and in the length. I had them check to see if there were any more of the mint/grey version in the system but so far, none to be found. I’m hoping for another price cut and a popback on this one. Next up, the Holly Sweater in Stripe. This comes in cement/ivory and navy/peony. I’m stripesick so I had to give it a try. I tried a large. This is still full price in store. This was a little loose through the body, but if I were layering it I am not sure I’d want it much smaller. I don’t need anything else with stripes but I would probably try the medium for comparison. I believe this sweater is all lambswool, which is much better than a lot of the wool blends out now. I like the ribbed crew neck, it reminds me of some of the older style J.Crew wool sweaters. This wasn’t scratchy to me, but it is lambswool which I know people find to be less soft than other wools. Next up, the V-Neck Tunic Sweater in Heather Pewter. Again, I don’t really need a grey sweater but I wasn’t personally a fan of the other shades in this sweater – but I’m sure others will be, I can see the Cinnamon and Bright Ocean being popular, as those were the most picked over at my store. I wish the pink color hadn’t been quite so peppermint pink, a little paler and I may have been sold. This is a medium. The back of the sweater is ribbed and I found the wool to be soft, softer than the Holly sweater. 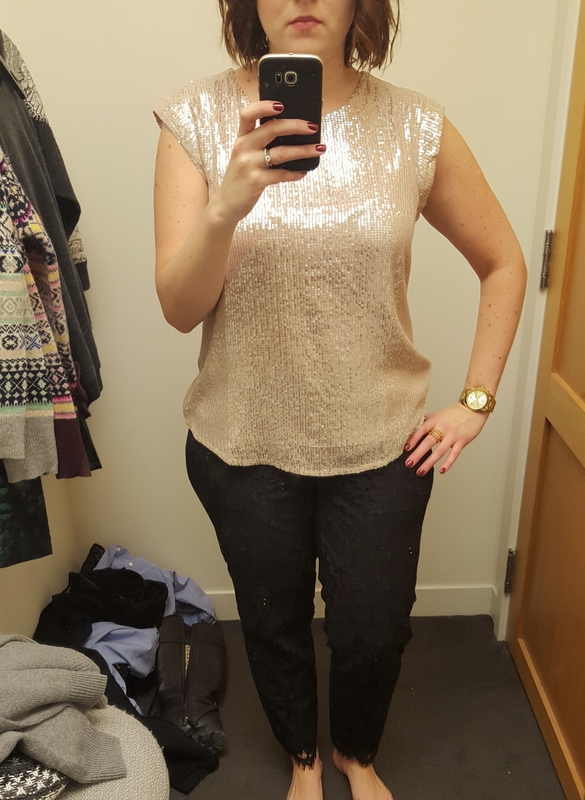 I didn’t recall seeing this top online, it’s the Holiday Party Top in Sequin. It was the last one on the rack in the store, in a size 12 so I grabbed it to try on with the lone pair of Pull-On Pants in Floral Lace. 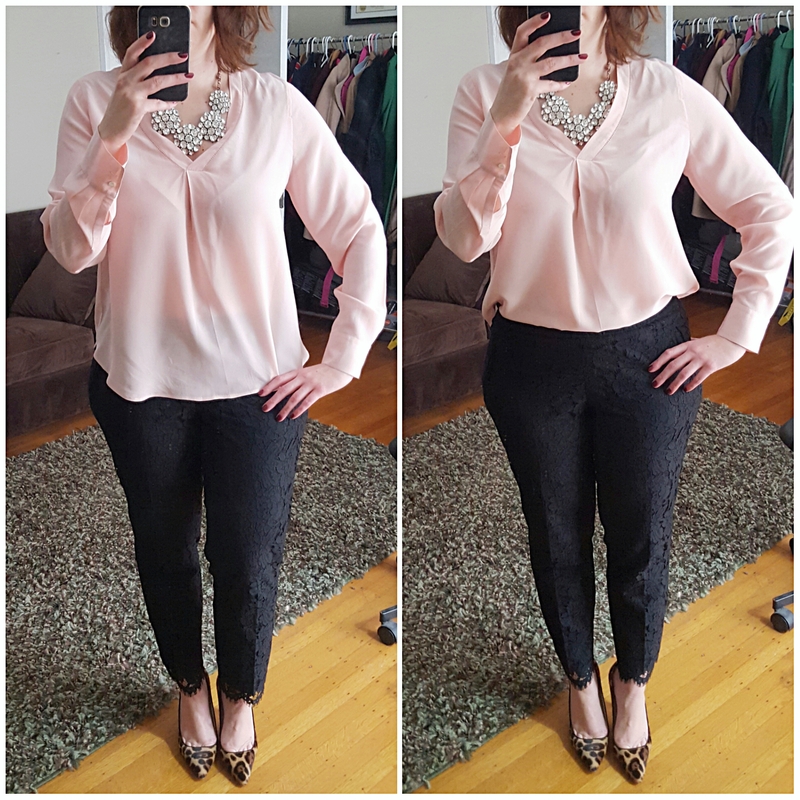 The tag says that the blouse is beige but in person it read more of a blush pink to me. It was a little large, I would have liked to try a 10 for comparison, I liked the more subtle sequins though and this would look great under a blazer. 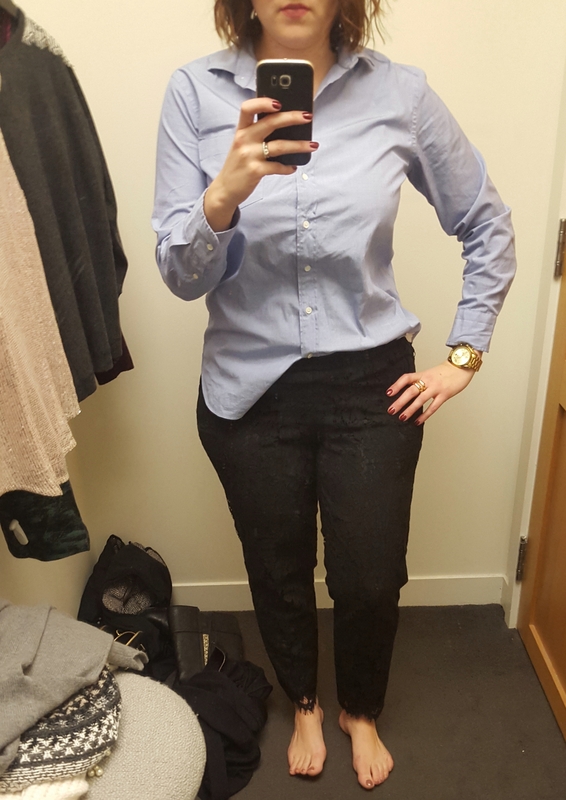 It’s hard to see the pants in this photo, but they’re a size 10T. And they fit! Still not the best shot but you get the general idea. I liked that these hit my ankle, and I was able to sit without them pulling. I would have liked to try a 12 for comparison. I read that these pants ran large, and being that I’m usually a 12/14 in pants, and these are a 10, I agree. I think I asked five people in the store for their opinion but they all said they looked good. The pants were the only thing that came home with me, they were full price yesterday (go figure) but I was excited to see they hit sale this morning so I will be going back for a price adjustment. I did also order the size 12 to compare and see the difference in fit. I think I expected these to be like other drapey pants with them being a little looser in the waist, but being they are lace, I think it makes more sense that they’re streamlined. I showed them with the blouse tucked and untucked for comparison, I think I’d try these with a crisp white button down and maybe a blazer for work, or a black turtleneck and ivory blazer. If I had something fabulous to do for New Year’s Eve, these would definitely be an option. But, knowing me, I’ll figure out how to style these for work. I know I’m a total sucker for lace, but I love the hem on these and I’m not sure I would want them much shorter. So, what do you think? Any favorites? Have you made any good sale after holiday sale purchases? Would love to hear what you think and thanks for visiting! What a great post! I love when people give dressing room reviews lol! As someone that has never set foot inside J. Crew I truly appreciate these reviews. I think if you to buy only one thing…you made the right choice, the lace pants. I love how they look at the ankle too. I liked the sequin top too though and agree under a blazer, one of those satin lapel/tuxedo type it would look good. It caught my eye in the catalog too but I’m not really a sparkly kind of girl but appreciate it on others. I liked the raisin sequin fair isle on the model online with the coordinating faux leather raisin pleated midi skirt, especially if you are tall, that midi length looks good. Did you see those skirts there? The navy mini (concerned about the length being too short though) pleated faux leather is the one thing I wish I could see/try on. Thanks for the reviews! Thank you! I really want to get back in the habit of dressing room reviews. My store didn’t have those skirts. I like the midi length since I’m tall but I have a love/hate with pleats – it really depends on the skirt and I probably wouldn’t rush to try it. If I were a smaller size with less hips I may have attempted it. The gold skirt has gotten fantastic reviews, lots of love online. Thanks so much for stopping by and taking the time to comment! The fair isle in ivory multi in the size you were looking for has popped back! I hope you’re able to get it.